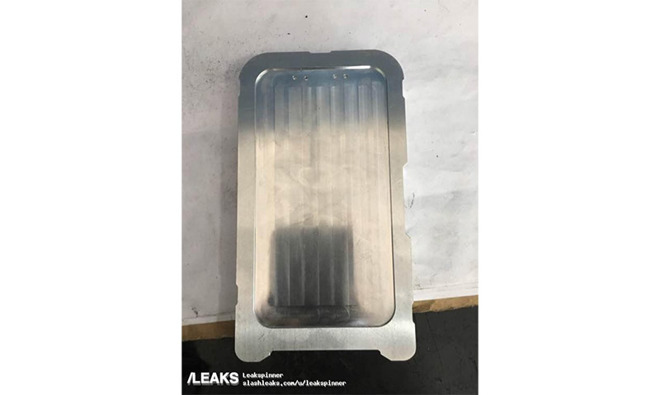 A set of unverified photos posted online on Friday claim to show manufacturing molds, as well as a schematic diagram for said molds, being prepared for production of Apple's "iPhone 8." Posted to hardware leak website Slashleaks, and later distributed via Twitter by Benjamin Geskin, the supposed "iPhone 8" material appears to line up with rumors already circulating about Apple's next-generation handset. In particular, a purported rear casing mold reveals what looks to be space for a vertical dual-camera array, positioned in the top-left corner of the handset. As the photos were posted without accompanying identifying information, including an origin source, AppleInsider is unable to vouch for the veracity of the photos and offers the following for purposes of discussion. 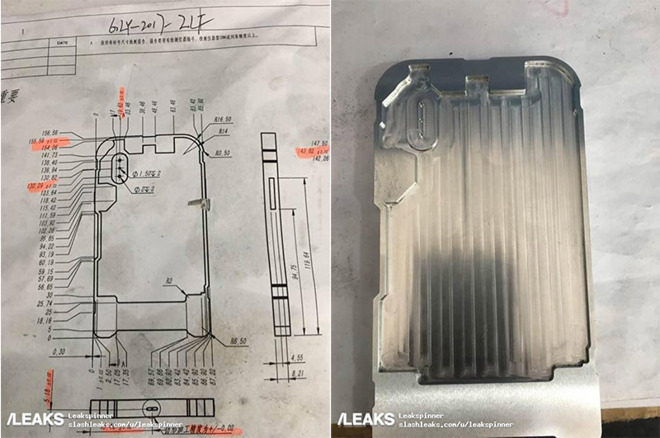 The schematic shows three views of a manufacturing mold thought to hold parts destined for, or near, the "iPhone 8" rear casing. Along with the rear perspective, the diagram includes a side view showing a SIM card slot and a bottom view highlighted by a single Lightning connector. Noticeably absent is a cutout capable of accommodating Apple's Touch ID sensor, a feature that according to previous leaks might be repositioned to the device back. Second and third photos provide a look at the supposed molds. The trench in the mold corresponding to the schematic is much shorter than that of a second mold thought to relate to the handset's front face. Additionally, the front mold incorporates four holes that will presumably house cameras and proximity and light sensors. Interestingly, there is no ear speaker cutout, meaning Apple is attempting an under-display solution or the mold is meant to carry an intermediate part positioned between the logic board and cover glass. Considering their respective size and internal structure, the molds, if legitimate, are likely designed for the production of internal components. Apple is expected to launch three new iPhones this year. Along with the usual "iPhone 7s" upgrades, the company is rumored to debut a high-end "iPhone 8" that will include a number of exotic technologies like an edge-to-edge OLED display, integrated Touch ID, 3D sensing FaceTime camera and more.